The poor college students guide to raising a baby: Lookie what I got! This morning I opened the front door and much to my surprise was a big box waiting for me! 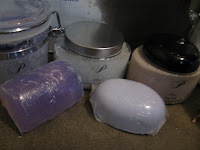 It was the prize I won in the big giveaway party over at the BUZZ . 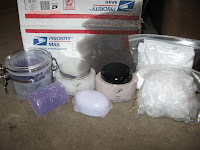 It was an AMAZING gift set from Plush Naturals and let me tell you, it is AMAZING! Sadly as you can see, the body scrub spilled and leaked all over the box, but that just made it smell much more inviting upon opening! lol. I cannot WAIT to get in the bath when DH comes home to watch the baby. YIPPPEEEEE! Thanks Brandy for hosting the giveaway, and thanks My Plush for offering it up! That sounds wonderful. Have a nice bath night. I want to smell. Glad it arrived sorry it spilled! Wht a neat gift set. Glad you won! 3 things every parent should know! Tutorial- easy and cheap gift for any kid! Its a big day in our house!